Burton, a 30 minute drive south of Nakusp on Hwy # 23. How to get there: Once in Burton drive to the end of McCormack Road (approx. 5km’s) . At the end of Mc Cormack road you will merge with the Snow Creek Forestry Road stay straight and continue another 2km’s keep an eye out for our staging area (hard to miss) . Your custodian will contact you a week in advance of your flight day to set up a meeting location in Nakusp. This meeting is on the morning of your flight At 7:30 a.m. ,at one of the local cafes.if you wish to have breakfast be at the meeting place at 7:15 a.m. During this meeting your group wll be given “WAIVERS” to sign . Your custodian will guide you to the heli staging area. Your group is expected to be at the heli staging by 09:00 A.M . Your custodian will organize the helicopter logistics. Once you arrive at the lodge you will be given an orientation in regards to the use of the facilities. Group size is excluding the Custodian. Weigh all your gear prior to arrival to ensure you are not over the allowable. If at staging you are over the allowable gear weight, we will have to make an extra flight, the cost for this is $400.00 CAD (cash only). a. If you know you ar/will be overweight, or just want to take in extra gear, please notify the office prior to your flight to make arrangements to prior to your trip. Our custodians will be reweighing your gear at staging. It is very important you are punctual and completely organized for the flights. There may only be a short weather window to allow for the flights, and if you are not organized, time will be lost and this may mean you might not make it into the lodge. It also creates a rushed situation, we don’t want rushed situations especially around a helicopter . Could be dangerous. The helicopter is scheduled to land at the staging area at 09:30 hrs. 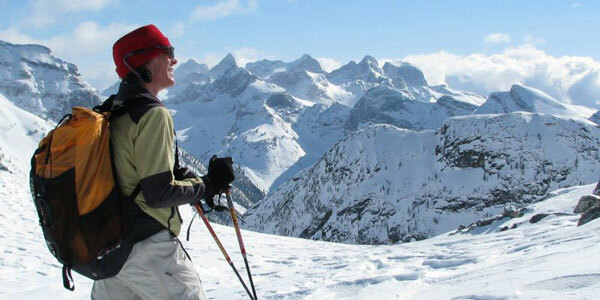 You should be dressed as for a day of skiing with your ski boots on and your daypack packed for a day of skiing. Do not load your daypack with anything else other than what you would take for a day of skiing. Shovels etc. is in your pack. Your skis including straps and cables should be strapped or taped together. Your daypack, skis and poles will be part of your passenger flight. A separate sling load of gear will be weighed out and prepared for the helicopter. One pair of extra skis is allowable per flight. If we are not overweight. We recommend you carry insurance for your self and equipment. Ideally Food and fluids should be transported in Plastic totes. cardboard boxes are okay but must be strong and sturdy. Any extra clothes and misc. should be packed in a larger backpack in case you can not fly out and have to ski out. The custodian will organize and deal with all the helicopter logistics. You will be given a helicopter safety briefing once all the gear is organized. The custodian will organize and deal with all the helicopter logistics. You will be given a helicopter safety briefing once the helicopter has landed and shuts down.